One of the difficult concepts to overcome is the belief that I am less; less important, less smart, less pretty, less loved. In a family with favorites, I was informed multiple times that I would be given less food, less attention, less time, less money because others in the family were more important than I was. I was raised with the words ringing in my little ears, “Take care of your mother, sister, brothers….” No where in here was the concept that I needed to be taken care of. My requests, my needs were ignored or flatly refused. There is something elemental that shifts in the mind of the child when they are told they must go hungry so that someone else, more important, can have seconds. 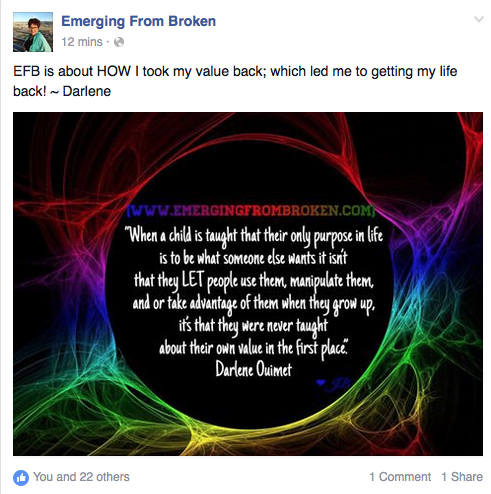 Believing that I had value and worth is still an ongoing struggle. I am learning that I am worth caring for. My needs and wants are worth meeting. I am of value and worth. Thank you for sharing this. Very powerfully written and I completely relate. I have found that the more I try to fight the feelings ingrained of being “less than” the harder some people fight to keep me from being more. The most important thing I have realized is I am the only one that can make that a reality. The harder they fight to keep me down, the stronger I become. Less… even though I cognitively know I’m not “less”, I still must act like it. I carry myself like I’m less. When I try to change, someone will “correct me”. I attract the ones who are “more than”. I never know when my actions show a sense of dignity, or will come across as arrogant. I went from an abusive childhood to an abusive marriage. Recognition of human value shouldn’t have to be earned. I have so little experience. I try to exert myself, but I have no energy to fight against the current. I fight, but I usually end up without energy or hope. My character has been assassinated several times. I’m just present. Wouldn’t really call it living. Even if people and circumstances changed, I have “less than” half of my life left. Where would I find the love of someone who could value a person who is so damaged and hurting and needy? I learned that I started with myself and loving myself enough to set boundaries. I have several post on boundary setting. This is where my counselor started with me. I am sorry this is happening to you.